Historical riding habits for ladies are stylish dresses. In the mid-18th century they could be worn for riding but also for walking and visiting. The colours of riding habits were often darker than those of morning dresses or ball gowns. The cut of the riding habit and its ornaments – large turned cuffs, trims or buttons – were inspired by male attire. I had been looking for an excuse to make a riding habit for myself for a while. When I was invited to an event set in fictitious Vauxhall Gardens in London of the year 1750, the opportunity arose. So far, two ball gowns were successfully created this way. You can see them here and here. Additionally, I would need lace, an ornate braid and a panier. A panier is a kind of hoop worn under a skirt to create the hip extensions being fashionable in the mid-18th century. A short version of the panier, known as ‘pocket hoops’ or ‘side panier’, featured a small, lobster trap-like structure on each hip connected by a waistband. 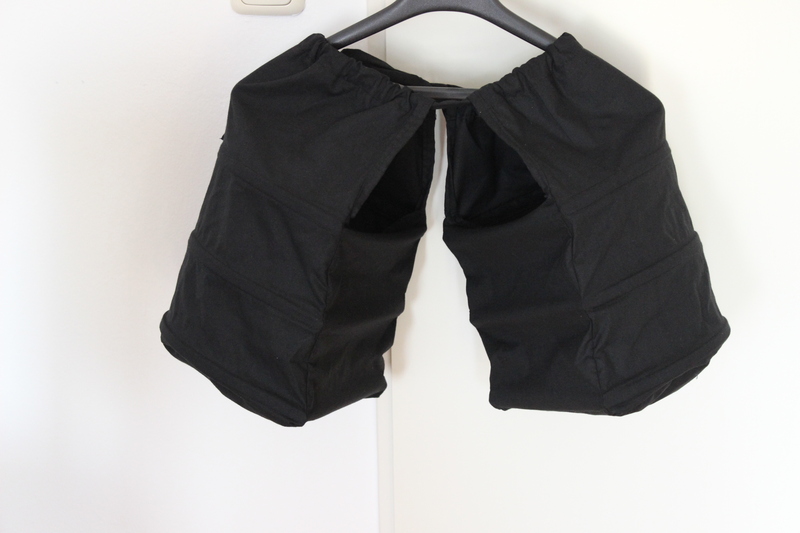 The advantages of pocket hoops are that they are light, you can sit down without trouble and you can use them as a pocket for money, etc. Where would I get such a wonderful garment? It turned out that there are still makers of paniers and hoops in the modern world. They sell their products via internet. I bought a braid for the riding habit at my favourite oriental drapery. 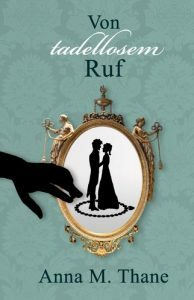 For the cuffs and the jabot, the white lace shirt Lucia had discarded as undergown of the red Empire ball gown came in handy. 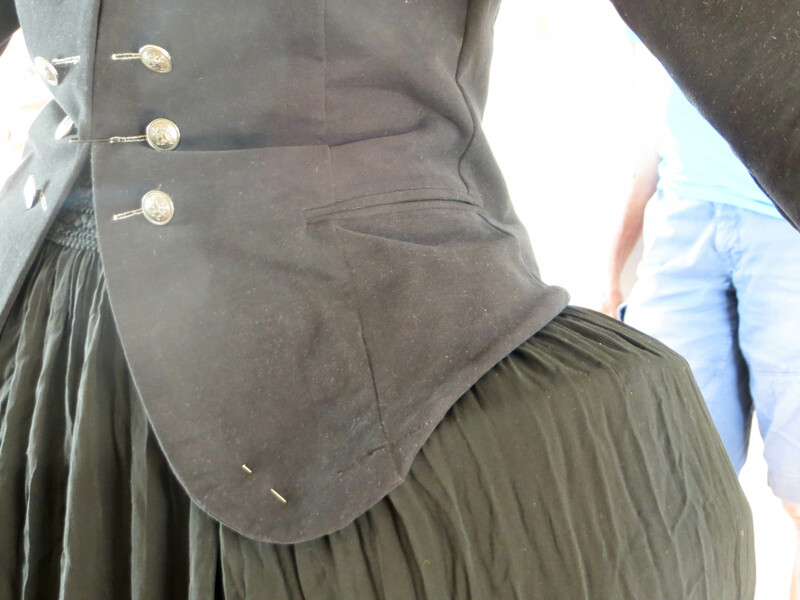 Anna wants to wear the jacket again after the historical event – without the ‘1750ies touch’. This meant I couldn’t cut the jacket, but had to do all adjustments with careful, ‘invisible’ stitches. Make the modern skirt fitting to the pocket hoop. As the hoops stretches to the sides, the skirt’s length must be adjusted at the front and at the back. Otherwise it would be lopsided. I made the adjustments to the jacket mainly by hand. The jacket already featured a narrow straight collar and buttoning as were common for riding habits. So I turned the seam at the back inwardly and stitched it up. Thus, the lower part of the jacket now imitates the curve of the men’s frock coat. I also added hooks and eyes to the front so that Anna can close the jacket. I than adorned the sleeves with braid and cuffs. To adjust the skirt I needed Anna to wear it over the pocket hoop so I could take the measurements. These pocket hoops are amazing. They create the special historical look. I adorned the hem of the skirt with the braid. The jabot was a fun piece to do. I hadn’t had a sewing pattern for a jabot, so I made one up myself. 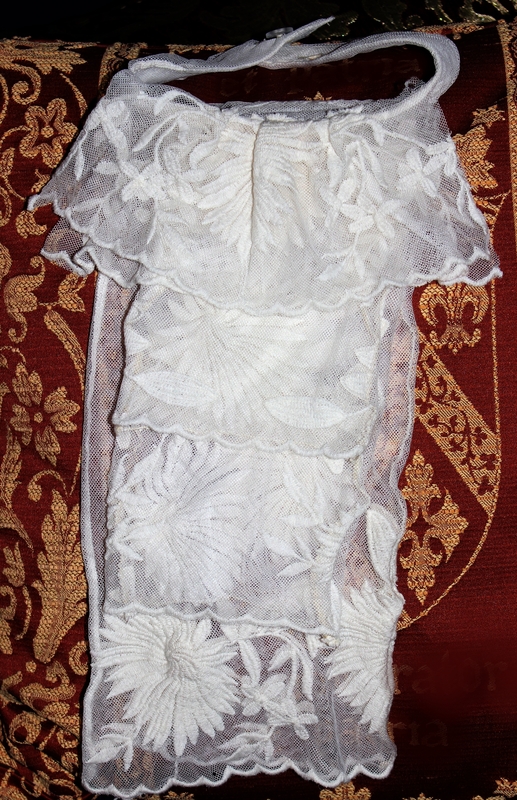 The jabot has 4 rows of lace and is secured behind the neck with a button. This is a modern way of fixing it. Traditionally, strips of cloth would simply be tied together in front of the neck and hidden behind the lace. The jabot is very long and covers the front completely. It conveniently hides the medieval drawstrings of the cotton shirt. While Lucia did her magic with needles, threads and sewing machine, I took care of the accessories. At a flea market, I found this lovely fan. It features baroque motifs. While it is not from the mid-18th century, it is about 100 years old: The fan was created around 1910 as advertisement for the ‘Pompeia’ perfume bei L. T. River. I had to restore the leaf carefully using small pieces of Japanese washi paper and bookbinding paste. I created buckles for the shoes from simple plastic hair clips. I painted them with silver glue, as acrylic paint refused to stick, and added many fake gems. 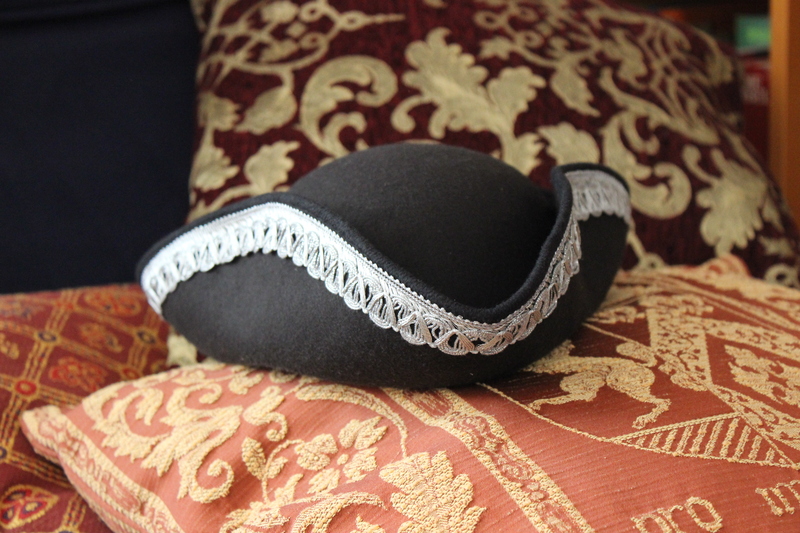 The tricorn was a popular hat during the 18th century. It is exactly the kind of thing a history nerd has to have. I bought mine a couple of years ago at a fancy dress shop. Additionally, I did a little bit of research about make-up. Around 1750, the artificial beauty patch was still very fashionable. It was made from silk or velvet. 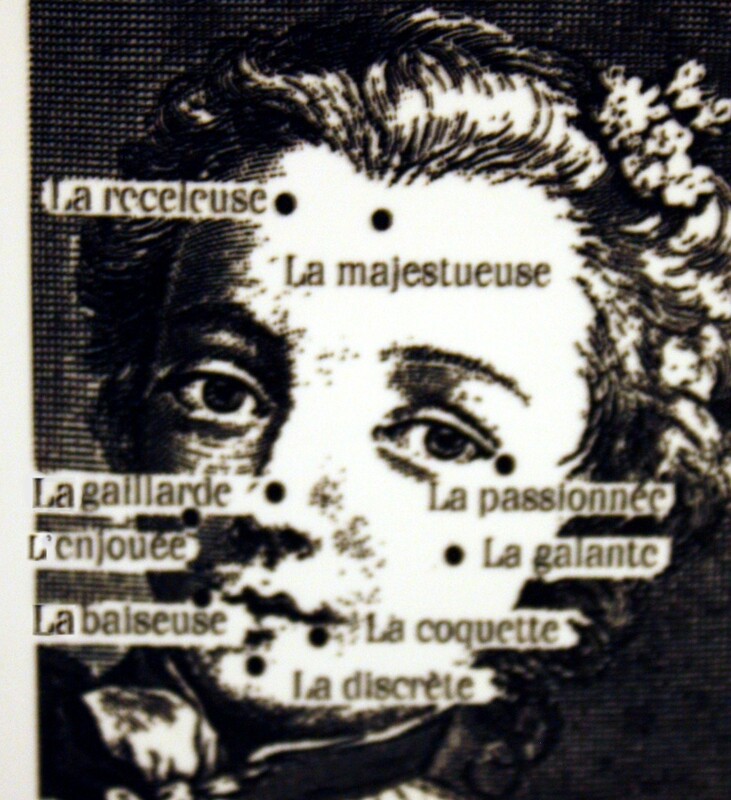 The way a lady placed the beauty patch was believed to have a special meaning. It’s of course very flirtatious. A well-bred young lady of the Regency period would blush. the receiver (la receleuse) – on the temple. Voilà, here is a riding habit for time travelling to 1753.